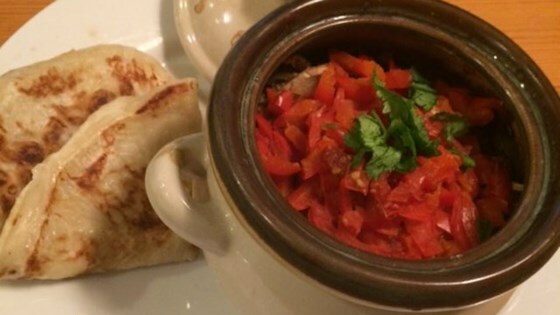 "A traditional Georgian stew made with lamb, mutton, or beef combined with potatoes, eggplant, peppers, and herbs. [Recipe originally submitted to Allrecipes.ru]"
In a heavy casserole dish, layer the following order: lamb, onion, potatoes, eggplants, garlic, tomato paste, tomatoes, red bell pepper, parsley, and dill, seasoning each layer with salt and pepper. Pour a few spoonfuls of water on top. Cover with a lid. Bake in the preheated oven until lamb is tender, about 2 hours. Mutton or beef can substitute for the lamb, if desired. Also you can use any variety of mixed chopped fresh herbs - parsley, dill, basil, or cilantro are all good options. Use about 1/4 cup of any variety of fresh herbs (parsley, dill, basil, coriander). This stew also be cooked in a lidded clay pot. I cooked this in multi-cooker. Made it with lamb. Very tasty as well as healthy. Best lamb stew I've had since my grandmother made it - absolutely wonderful - very flavourful. I did use lamb - don't care for mutton. Do try this one, it is exceptional.